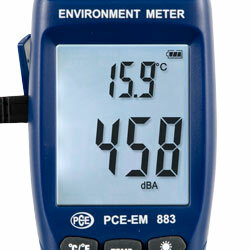 The environment noise analyser PCE-EM 883 combines all major features for determining the environmental conditions. Due to its different external sensors, the environment noise analyser PCE-EM 883 is able to measure multiple environmental parameters. These are temperature, relative humidity, sound level, illumination level and wind speed. Therefore you can measure the environmental conditions with just one device in no time. In addition, the environment noise analyser is a handheld device, which you can also use for fieldwork. 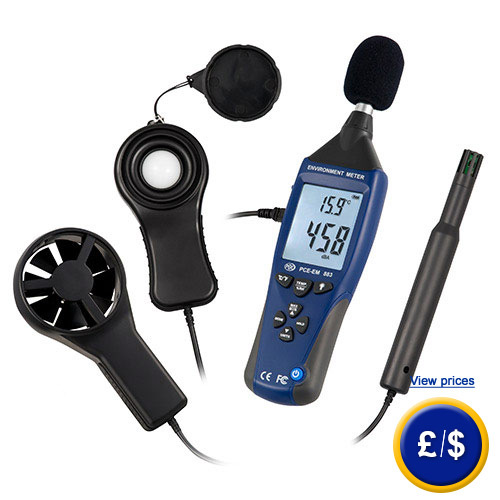 The handling of the environment noise analyser is very easy. You can use it with one hand only and access all key functions via its 8 buttons. The illuminated display allows the use in areas with bad lighting conditions. If you have further questions on the environment noise analyser, please take a look at the following technical data of the environment noise analyser or call us on: UK customers +44(0) 23 809 870 30 / US customers +1-410-387-7703 or make use of our contact form. Our technicians and engineers will assist you in regards to the environment noise analyser or any other of PCE Instrument's products in the fields of measuring instruments, process control technology, or the scales of laboratory equipment. 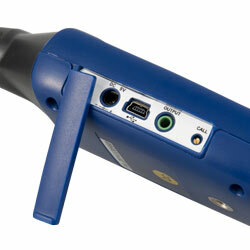 The connectors of the environment noise analyser are installed on the side of the device. Here you can see the display backlight of the environment noise analyser.